Fors Clavigera: Picturing "Church" & "State": Crayer's "Benedict receiving Totila"
Picturing "Church" & "State": Crayer's "Benedict receiving Totila"
Earlier that day I had led a seminar on William Cavanaugh's classic essay, "'A Fire Strong Enough to Consume the House': The Wars of Religion and the Rise of the Nation State." In this 1995 article, reproduced in the Radical Orthodoxy Reader, Cavanaugh documents that the so-called Wars of Religion were not actually driven by theological and religious difference but rather by the consolidation of nation-states after the demise of feudal arrangements. While the modern, liberal, democratic stated claims the status of "savior" who delivers us from the violence of religion, in fact it was the rise of the nation-state that engendered these wars. The state gets to play "rescue hero" fireman because it was also the arsonist. In the course of the analysis, Cavanaugh debunks the myth of secular neutrality that undergirds the modern state. The nation-state doesn't deliver us from theology; it delivers us over to a different (covert) theology. Indeed, in the words of Hobbes, Leviathan doesn't deliver us from the ecclesia; Leviathan swallows the church and functions as a parody of the ecclesia. The work, by Flemish painter Gaspar de Crayer (1584-1669), is entitled "Saint Benedict Receiving Totila, King of the Ostrogoths, 1633." The huge canvas (it must be 8' x 12') hung in a Benedictine Abbey in Flanders. 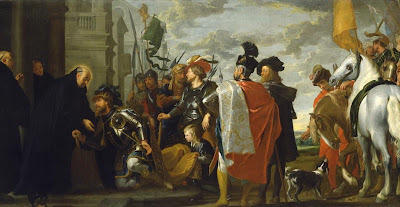 It portrays the repentance of Totila for having previously deceived Benedict (by sending a servant dressed in his armor). It might be easy to think that this painting depicts the inverse of what Cavanaugh notes, namely, the church ruling over the state. But of course that's not the case: Benedict is not the Holy Roman Emperor, he is an abbot. Totila is being received at an abbey, not submitting to a rival king. And yet Benedict does not shrink for prophetically denouncing Totila's violent rule. Retreat into the abbey was not a withdrawal from worldly concern; it is a retreat to contemplative work for the world. The painting itself depicts what we might call the "porosity" of the abbey. It also illustrates that the abbot is not indifferent to the shape of worldly rule, even if he might be characterized by a sort of holy ambivalence.